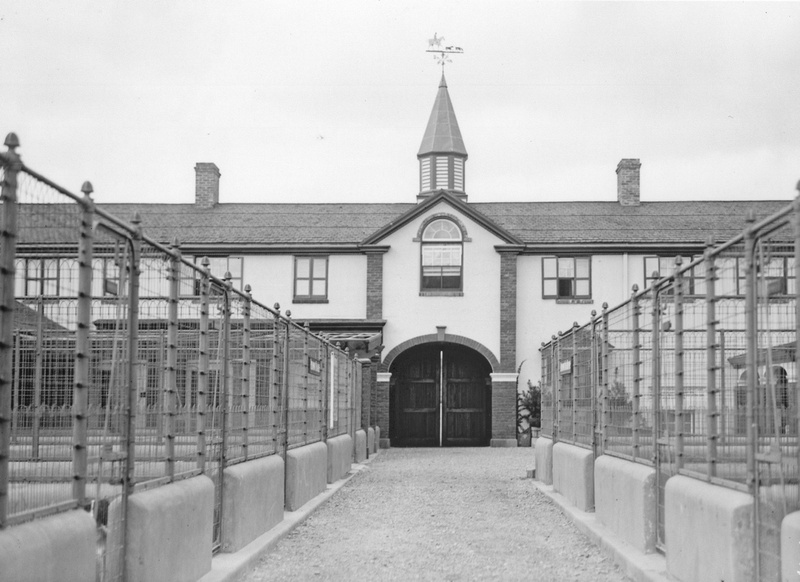 Joseph B. Thomas's Huntland kennel, photographed circa 1914. Author Alexander MacKay-Smith once referred to them as "the most perfectly appointed foxhound kennels and hunt stables in America." Photo courtesy of the Karen Myers collection. VIRGINIA photographer Karen Myers has unearthed a real gem: a small collection of historical photos from Virginia foxhunting a century ago. To see the collection online, click here. The houndbloggers were especially pleased to see an array of photos of the Huntland kennel, which housed the Piedmont hounds. Huntland’s owner and the then Master of the Piedmont was Joseph B. Thomas, who–according to MacKay-Smith–at one time kept 105 couple of entered hounds and 48 couple of unentered hounds there for three days of hunting a week. 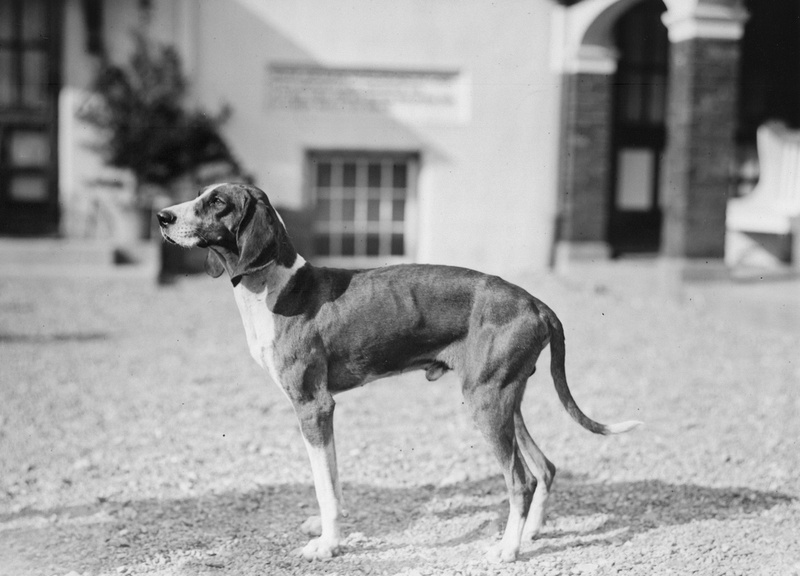 An American hound at the Huntland kennels. Photo courtesy of the Karen Myers collection. In a well-kept park near Mr. Thomas’s house stand extensive English-looking buildings of brick and stucco, which, viewed from a distance, suggest a beautiful country house, and which, visited, teach one that certain favored hounds and horses in this world live much better than certain human beings. 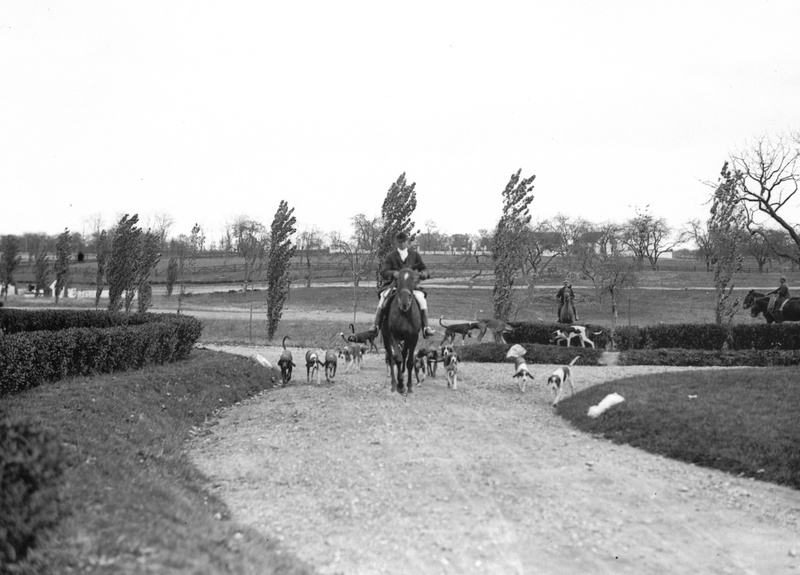 One building is given over to the kennels, the other the stables; each has a large sunlit court, and each is as beautiful and as clean as a fine house–a house full of trophies, hunting equipment, and the pleasant smell of well-cared-for saddlery. Thomas was drawn to Middleburg by the Great Hound Match of 1905, which inspired him to build this veritable temple to foxhounds. 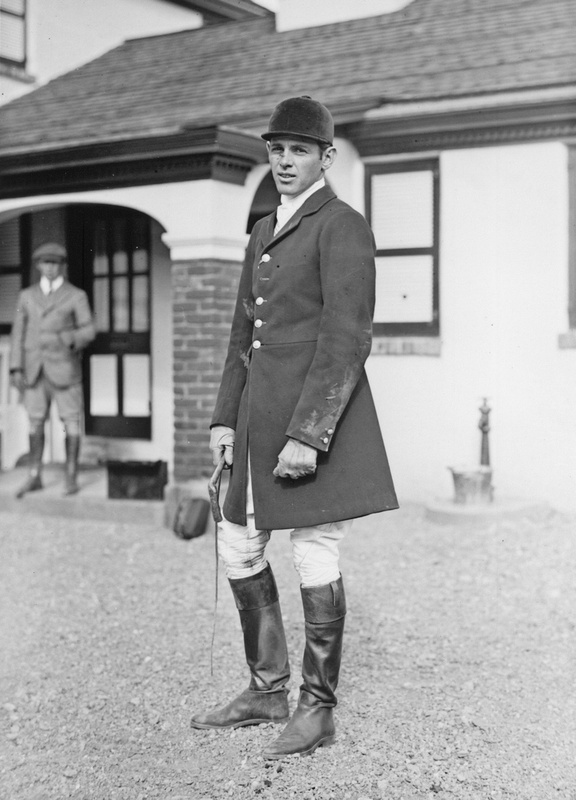 The “dashing, handsome bachelor and expert horseman,” as a 2008 Middleburg Life article put it, succeeded to the Piedmont mastership in 1915. 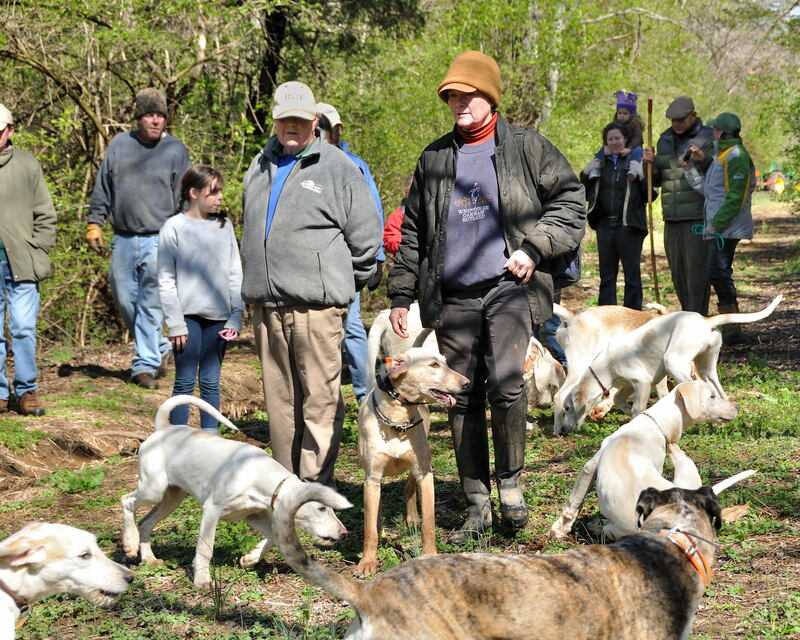 Huntland owner and Piedmont Master of Fox Hounds Joseph B. Thomas. Photo courtesy of the Karen Myers collection. Photo courtesy of the Karen Myers collection. … and a Hound Blog Hunch Bet Update! Speaking of the best of Thoroughbred horses, it’s almost Kentucky Derby week! 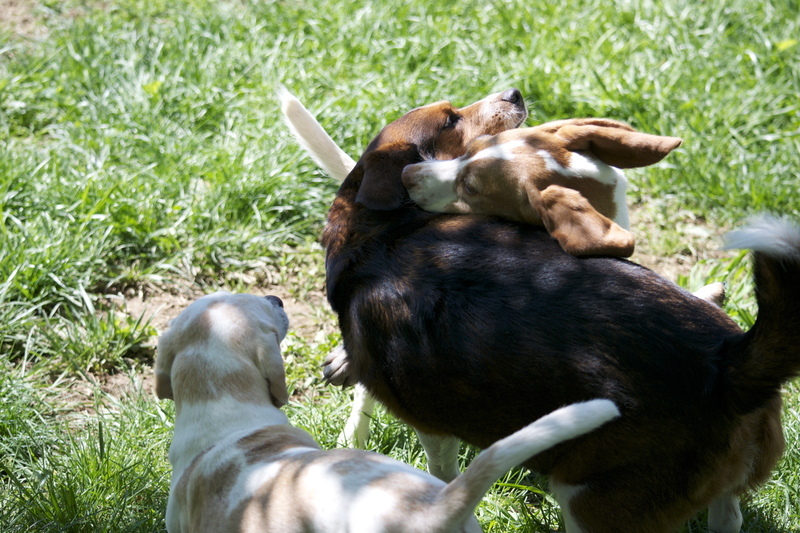 The race is on Saturday, May 7, at Churchill Downs, and, as regular readers of the hound blog know, our very own Tobermory Box is attempting to become the first beagle to win it. The Hound Blog Hunch Bet has now grown to an exacta, because Irish invader Master of Hounds remains in the lineup as of this writing, giving the houndbloggers the delicious prospect of a Toby’s Corner-Master of Hounds finish in the 137th Run for the Roses. And here’s another reason to root for Toby’s Corner: his breeders and owners, Dianne and Julian Cotter, are foxhunters. Both hunt with the Misty Morning Hounds, a drag hunt near Gainesville, Fla. Dianne is the honorary hunt secretary, and Julian is one of the field masters. They also host the hunt’s opening meet every year at their Snooty Fox Farm in Alachua, Florida. Toby's got a reason to smile: he likes Toby's Corner's chances! To read more about the Cotters–and about how Toby’s Corner’s mother and paternal grandmother almost became three-day event horses instead of the dams of two Derby starters–click here. There’s one other Hound Blog Hunch if you’re the kind of player who likes to bet trifectas: Shackleford, because there is a well-known place in the Iroquois Hunt country called Shackleford Hill, not far from the hunt’s headquarters at the old Grimes Mill. And if you’re looking for a horse to bet that has nothing whatever to do with the hound blog, as far as we know, the Beagle House hounds have made their picks. Except for Bingo, a teetotaler who also doesn’t gamble. We respectfully suggest $2 across the board on Midnight Interlude (Eider’s pick) or Stay Thirsty (Harry’s choice). 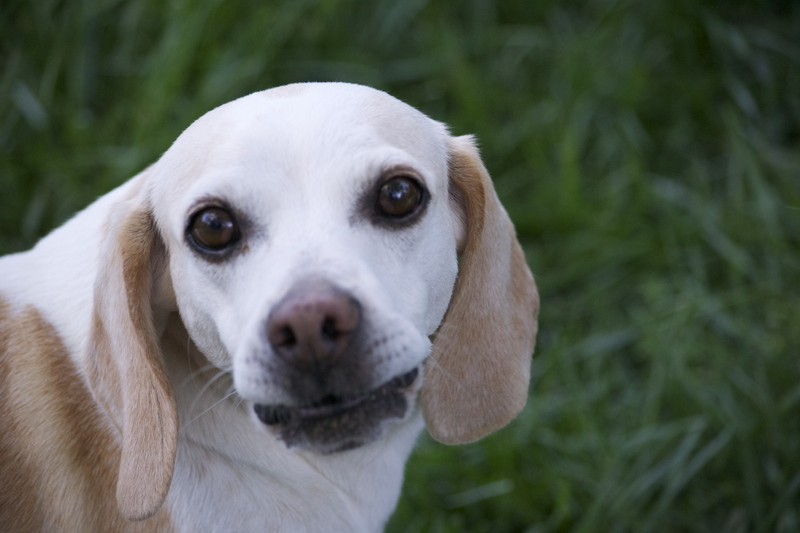 Could Eider, Beagle House’s newest resident, be part vampire? Evidence below. Toby’s on the Derby Trail again! Our Toby is working out again for the Kentucky Derby--just in case! WE can hardly believe it, but the hound blog’s little white beagle, Mr. Tobermory Ice Box, could be heading back to Churchill Downs for the Kentucky Derby on May 7–for the second year in a row! This is big news for a couple of reasons. 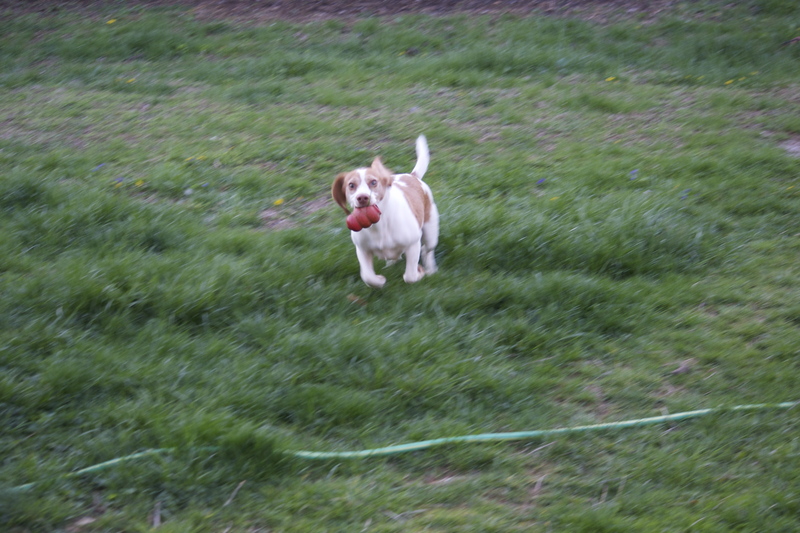 First, while the houndbloggers haven’t researched this extensively, we think it’s pretty rare for a beagle to run in the Derby. Second, because the race is for three-year-old horses only, it’s REALLY rare for a beagle to run in the race in two consecutive years. Last year, our Mr. Box was part of an all-box exacta, as you might recall. His namesake in the 2010 race, Ice Box, finished second. This year, he hits the Derby Trail again, thanks to the stunning (“It wasn’t stunning to ME,” says the white beagle) last-to-first upset victory (“I didn’t find it upsetting,” interjects the beagle) by Toby’s Corner in Saturday’s Wood Memorial. He’s got green and red silks. 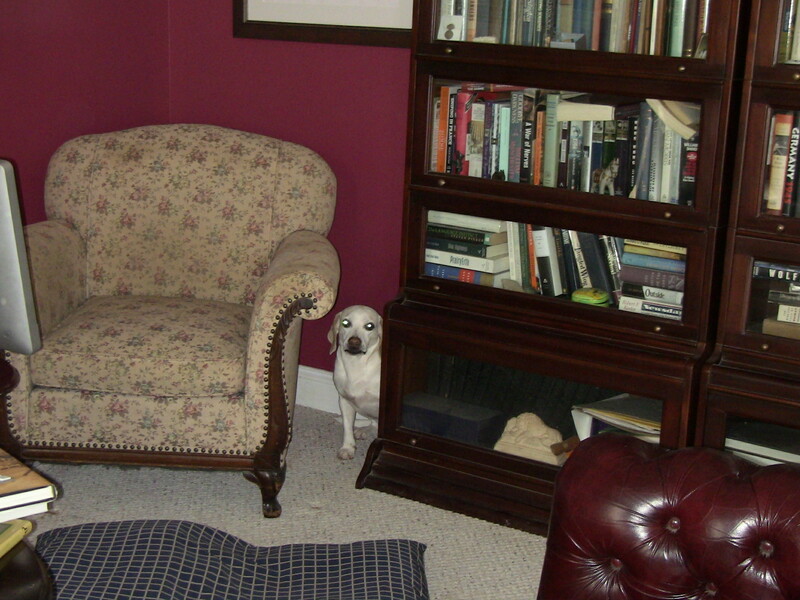 And here is Toby is his Corner. Hmmmm. Toby's eyes are alight at the prospect of another chance at the Kentucky Derby! The houndbloggers first picked up on the equine Toby’s Corner back in February when he won the Whirlaway Stakes, and we kind of hoped he might head Derbyward. He looks much more likely for the race now, after his Saturday victory over the previously undefeated Uncle Mo, last year’s two-year-old champion. Asked how he’s managed to become a Derby contender for the second year, Tobermory Ice Box credited his many names and nicknames, as well as the fact that he’s originally from Derby City: Louisville, Kentucky. He thinks he might also have been born in May, but he can’t be sure. 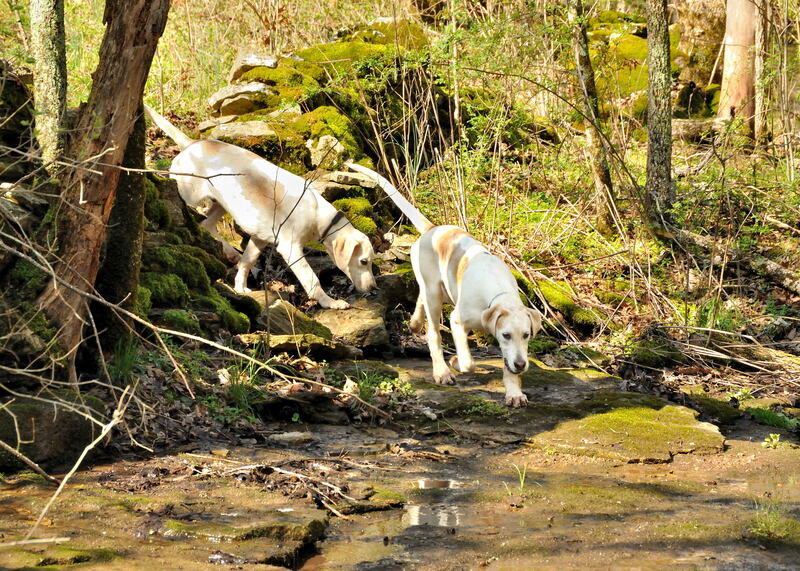 A former member of the Clear Creek Beagles hunting pack just outside Louisville, our white beagle originally was named Clear Creek Beagles Icebox. We added Tobermory when he moved in with us, and so he is variously known as Mr. Box, Toby, and Tobes. For a video and photographic look at Toby’s workout regimen (possibly the real secret to his success), click here and scroll down. This year, of course, he has another house hound to help him prepare for the Derby. That’s his cousin and another former Clear Creek pack member, Eider. 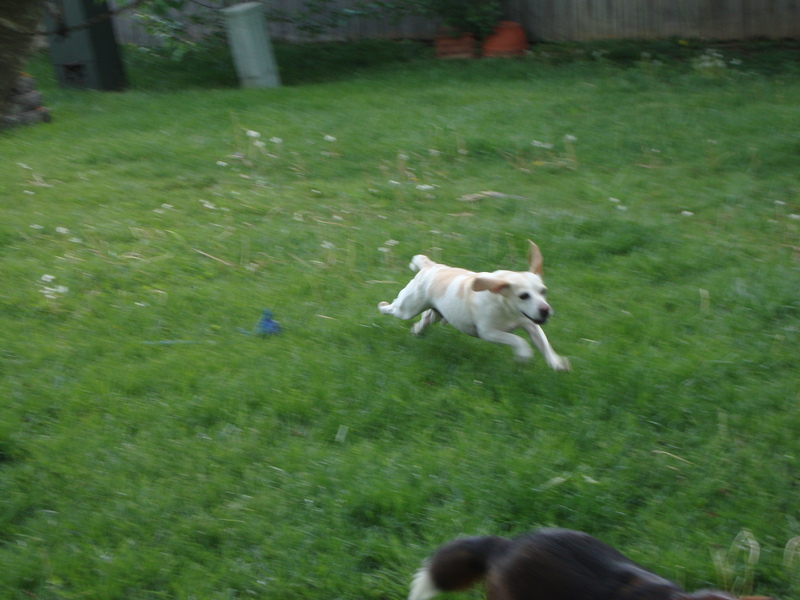 Clear Creek Beagles Eider has joined Toby's workout team this year. And, by the way, the 2011 Hound Blog Hunch Bet could get even better. There’s another possible starter this year named Master of Hounds. We kid you not. Stay tuned! 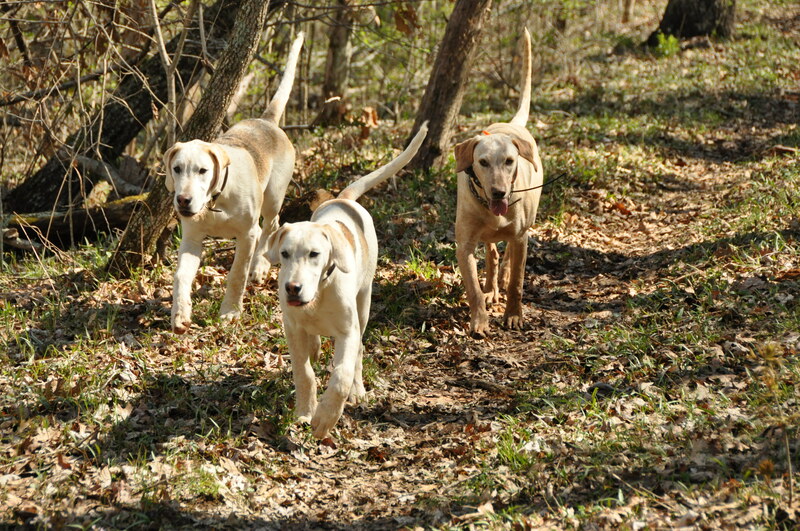 The HA puppies on their recent walk, as photographed by Dave Traxler. WE don’t want to say anything too soon, but … it looks like spring finally is here. 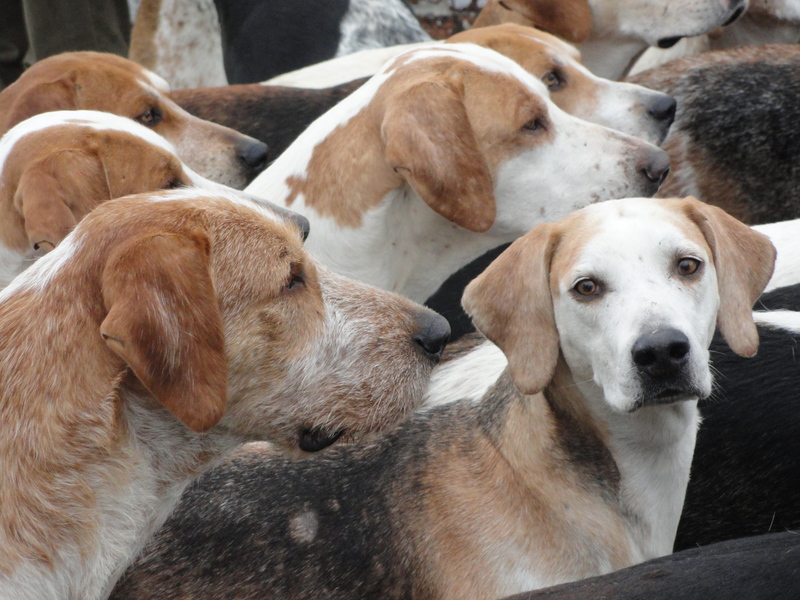 With hunt season behind them, the change of seasons mean the hounds’ attention turns to hound shows and summer walk. For the newest puppies at Iroquois, the so-called HA litter (click here for pictures and video from when they were teeny, tiny pups!) by Hawkeye out of Baffle, everything is brand new–including the change of season. Well, almost everything. While we were out hunting (or, in my case, riding with Michael Edwards in the hound truck), Iroquois member and kennel volunteer Cice Bowers was back on the farm, working with the HA puppies. As a result, the growing hounds have made an extraordinary amount of progress. 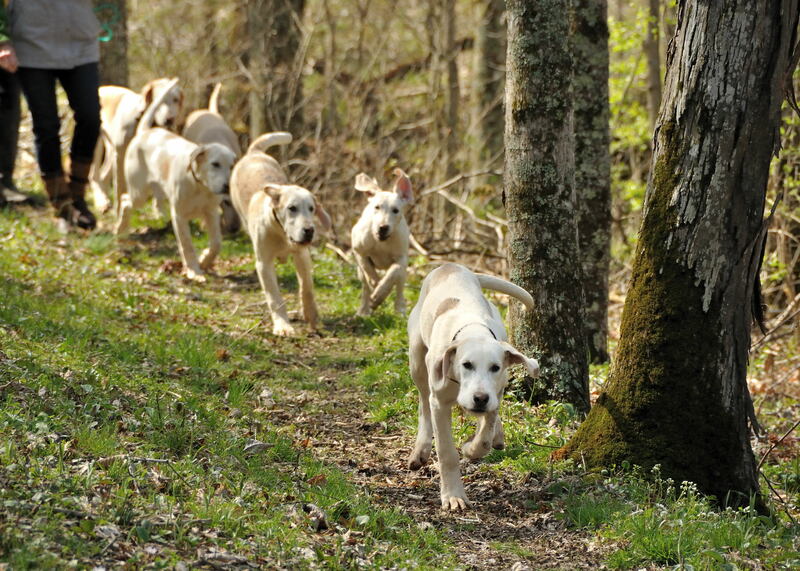 At just five months of age, they already have been taking daily walks and learning to come back as a group when called. So by the time we and an enthusiastic group of Iroquois members showed up for the first official puppy walk of spring, walking and coming back when called was almost old hat for the precocious HAs. Creek crossing were part of the adventure for the HA puppies. Photo by Dave Traxler. 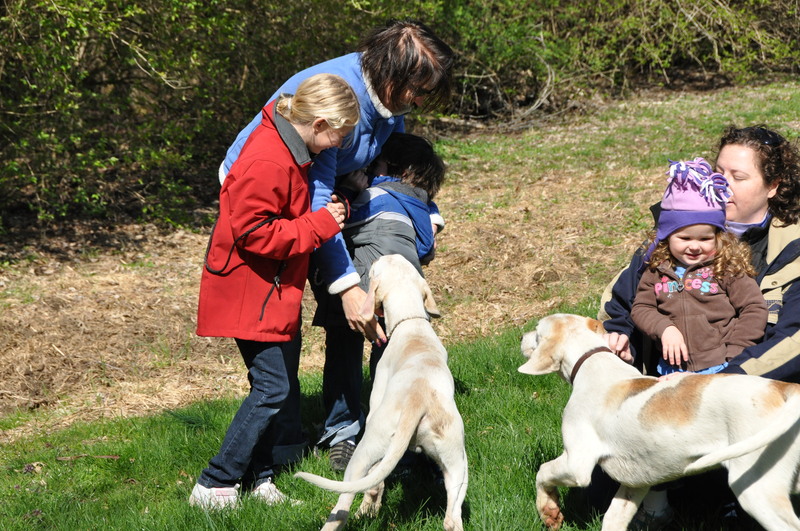 Cice Bowers (left, in gray fleece and light cap) has been working closely with the puppies all season. Photo by Dave Traxler. Why let the puppies run loose on the walk rather than put them on leashes or the traditional couples? “They learn more,” Lilla said. “They get to make their own decisions. I wanted to see whether they would stay with us, which they did. They’re kind of young yet to leash train, but even if we had them on leashes, it would be like having a fish on the end of a fishing line. They wouldn’t experience the walk we wanted them to experience: to be free in the woods, walk along with us, and go out from us and come back. 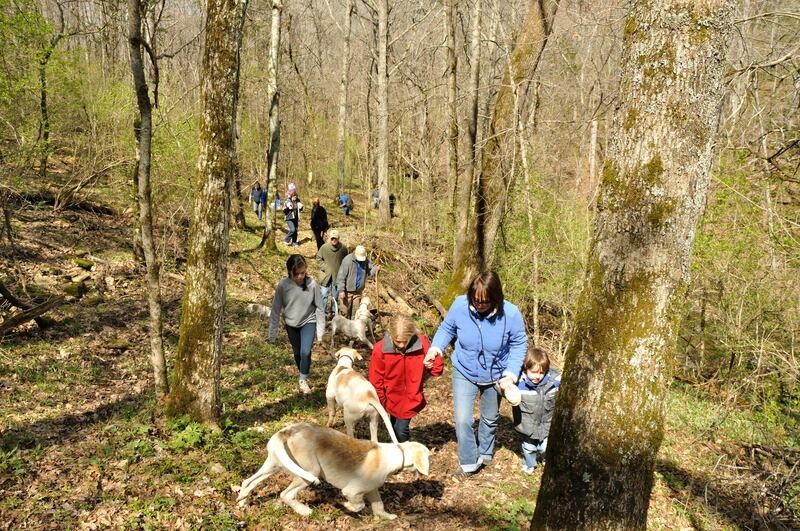 A walk in the woods benefitted everyone, not just the puppies! Photo by Dave Traxler. On Saturday’s walk, the puppies did get some new experiences, including meeting the local terriers and chasing after their companion, Magic, when she found what can best be described as an ex-rabbit. That presented a special challenge to the puppies’ discipline. 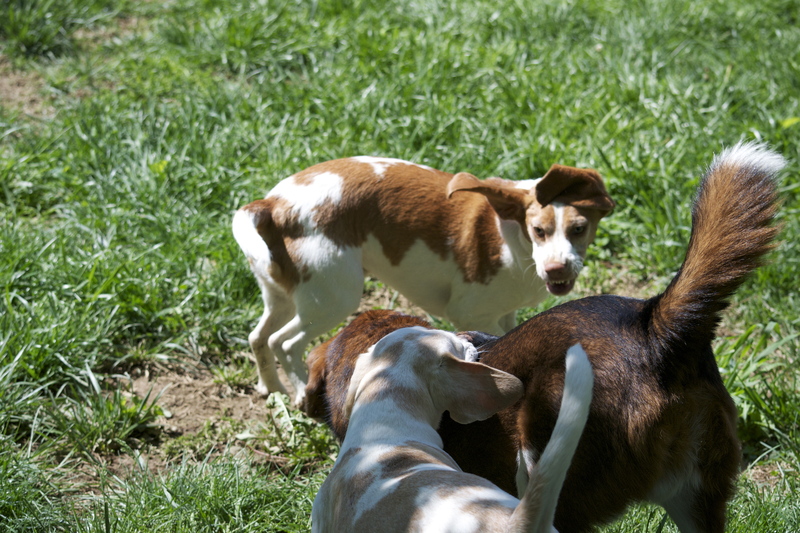 You might forgive a five-month-old hound puppy, or a litter of puppies, for getting so distracted by a dead rabbit that they forget to come back when called. But, amazingly, no forgiveness was necessary. Magic galloped down a narrow path with her long-eared prize, pursued by a line of wildly curious puppies, and they all disappeared around a bend. But when Lilla called out to them, here they all came back again, one by one. Except Magic, who enjoyed her rabbit lunch and met up with the group a bit later on the walk. It was frankly amazing to see how responsive the five-month-old HA puppies were, especially under circumstances that could invite disorder. You can actually see one of the puppies, Hanbury, making the decision whether to chase after Magic or return to Lilla at the 2:17 mark on our video from the walk; click below to see it. To see the high-definition version, roll your cursor over the video window; you’ll see a box that says “HD” appear in the upper right-hand corner. Click it! That good decision-making will be important when these puppies eventually join the working pack for summer hound walk and then hunting. The HA puppies and the kids on the walk found each other entertaining. Photo by Dave Traxler. “It’s immensely important,” Lilla said. “You want to turn them loose, but you want them to have that invisible thread with you at the same time. In our training program, this kind of training has been much more successful. We’re lucky to have the leeway to train this way rather than on couples. When they’re on couples, they learn nothing. But on a walk like this one, they get to make a lot of decisions, and they learn a lot. We want to let them make decisions, and then reward the right decisions. Magic (far right) joined the HA puppies on their walk. Photo by Dave Traxler. There’s a happy side-effect for the human participants, too–especially the younger ones. Driver says … Go, Cats! 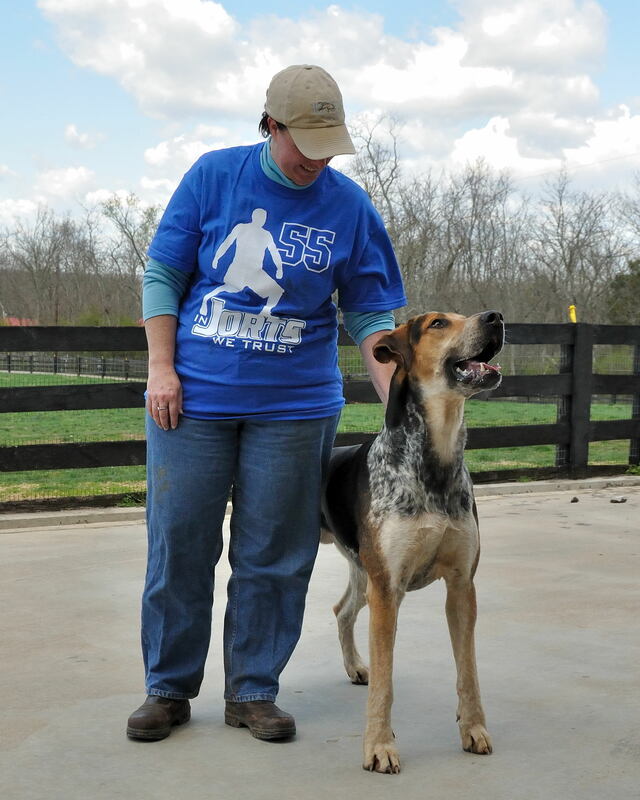 Iroquois Big Hound Driver told a houndblogger he's rooting for his human twin, Wildcats Big Man Josh "Jorts" Harrellson. Photo by Dave Traxler. NOW, everybody knows dogs don’t usually like cats, but in the case of the Final Four games tonight in the NCAA basketball championship, at least one hound is making an exception. In the most recent Hound of the Day report, the houndbloggers noted some similarities between the Kentucky Wildcats’ senior team member Josh Harrellson and Iroquois freshman Driver. Needless to say, we’re pulling for Harrellson and the rest of the Kentucky team in tonight’s game against the University of Connecticut.